December 2014 is likely to go down in the annals of international criminal justice as the month when the International Criminal Court (‘’ICC’’) faced its own ‘Bay of Pigs’. In the space of less than 10 days in December, Fatou Bensouda, the Prosecutor of the ICC, made two critical decisions in the work of the Office of the Prosecutor (‘’OTP’’). On 5 December 2014, the Prosecutor gave notice of the withdrawal of charges against the Kenyan President, Uhuru Muigai Kenyatta. In accordance with the Rome Statute, the Prosecutor can withdraw charges at trial stage but this has to be approved by the Trial Chamber. However in this case the Prosecutor did not require the Trial Chamber’s permission since the case was not yet at trial stage and her notice was in compliance with the Trial Chamber V (B)’s decision in which the Prosecutor was ordered to either withdraw the charges against President Kenyatta or demonstrate that she had sufficient evidence for the case to proceed to trial. The Prosecutor preferred the first option, emphasising that her office had not gathered enough evidence to prove President Kenyatta’s alleged criminal responsibility. Seven days later, on 12 December 2014, and during the 7337th United Nations Security Council (‘’UNSC’’) meeting, the Prosecutor stated that she was ‘left with no choice but to put investigative activities in Darfur on hold’. As noted by one blogger, Yvonne McDermott, the ICC’s statutory framework does not envisage a situation where the Prosecutor would suspend investigations on his/her own accord. Deferral of proceedings or stay of proceedings can only be done by the UNSC and the Chambers respectively. In her address to the UNSC, the Prosecutor pointed out that the decision was based on two factors: the limited resources and the Council’s lack of foresight on what should happen in Darfur. This post interprets the Prosecutor’s decisions in these two situations as a reflection of the fragility of the emerging machinery of international criminal law when states cooperation is not forthcoming. The decisions confirm the dangers associated with the ICC and the international criminal justice system’s ‘excessive reliance on state cooperation as primary means of achieving the mandated objectives of prosecuting persons for violations of international humanitarian law.’ In the situation in Kenya, it is hard to categorically say that the state failed to cooperate with the Court, considering that President Uhuru Kenyatta defied all odds including the advice from the African Union (‘’AU’’) and attended the status conference in October 2014. In 2013, the AU had decided, ‘’that President Uhuru Kenyatta will not appear before the ICC until such time as the concerns raised by the AU and its Member States have been adequately addressed by the UN Security Council and the ICC’’. President Kenyatta, however, made a courageous and unprecedented move when he temporarily relinquished his powers and attended the status conference at the ICC in The Hague. It is possible that had President Kenyatta failed to attend the status conference he could have been issued with a warrant of arrest. Such a step could have prolonged a case even though the OTP had admitted that it had insufficient evidence to proceed to trial. Following this logic, President Kenyatta acted wisely when he decided to attend the status conference. Still, what remains a mystery is what happened to some of the key witnesses in President Kenyatta’s case. It is bizarre that key witnesses recanted their crucial evidence. Such developments tremendously weakened the case against President Kenyatta. On the one hand, it is possible that some witnesses developed cold feet after realising that the accused person had become the Head of the State, the President of Kenya. On the other hand, some witnesses were alleged to have lied to the Court, their credibility hence becoming open to challenge. Witness 4 illustrates this. After the confirmation of charges against President Kenyatta, the OTP had to drop Witness 4, who had placed President Kenyatta at the ‘’planning meeting’ held on 26 November 2007, for two reasons: ‘he stated that he had lied in his earlier statements regarding the 26 November 2007’ and ‘he had been offered, and accepted, money from individuals holding themselves out as representatives of the Accused to withdraw his testimony regarding the PEV, and provided emails and bank records that confirmed the bribery scheme.’ In Kenya, a coalition of NGOs, the Kenyans for Peace with Truth and Justice (KPTJ), makes serious allegations that the executive branch of the Kenyan government was actively involved in obstructing the International Criminal Court’s work. Similar observations of individual or collective states’ lack of meaningful cooperation with the Court could be made in the situation in Darfur, which was also discussed in the previous post by Stefano Marinelli. The situation in Darfur is even more complex considering that Sudan is not a state party to the Rome Statute. Sudan’s obligation to cooperate with the Court was imposed on it through a UNSC resolution. However, Sudan has refused to cooperate with the Court, maintaining that it is a non-party State. However, it has to be said that at an early stage of the investigations Sudanese authorities were cooperative with the ICC. Sudan was even willing to cooperate with the ICC in the arrest and surrender of the Lord’s Resistance Army suspects. The tables turned when the Prosecutor submitted an application for the arrest warrant of President Omar Bashir in 2008. All forms of cooperation ceased. One would have thought that at this stage the UNSC could have taken measures to solve the impasse between the ICC, Sudan and the AU but that did not happen. The UNSC could have at least invoked article 16 and deferred the situation as per the AU request. The Security Council’s indecisiveness on this situation complicated matters further considering that Sudan is a host to one of the largest United Nations Missions in the region and has a considerably large diplomatic community that is expected to work closely with the Sudanese authorities including President Omar Bashir. Since the indictments and issuance of arrest warrants, the United Nations and the diplomatic community are expected to have limited contact with President Bashir and some of his government officials wanted by the Court. This has proved to be a political and humanitarian minefield for those heading different United Nations agencies that are in Sudan. For instance, in 2014, Herve Ladsous, the head of the United Nations peacekeeping operations, met President Omar Bashir, attracting widespread criticisms from human rights activists. Incidents such as these and the general lack of the Security Council’s leadership in resolving the impasse between the Court and Sudan, as well as Sudan and other states’ lack of cooperation with the Court, added to the frustration that lead to the shelving of investigations. What is of significance, and probably the inconvenient truth from the Prosecutor’s decisions, is that the international system and the principle of state sovereignty seems to be reclaiming its lost ground from international criminal law. There is no doubt that the establishment of the ICC imposed some limits on the principle of state sovereignty. The developments in Kenya and Darfur have put doubts in the idealist approach to the enforcement of international criminal law that considers state cooperation as a given. As long as state sovereignty remains the organising principle of the modern international system, it is hard to envisage the enforcement of international criminal law against sitting heads of states and those in power as they can frustrate the work of the Court by not cooperating. They can easily turn to their states’ financial, logistic and diplomatic machinery to frustrate the enforcement of international criminal law. The UNSC’s ability to act in this regard is so compromised by the interests of individual permanent members that it cannot be a reliable partner for the ICC. More so, the majority of the permanent members of the Security Council are non-party States to the Rome Statute. This raises genuine questions about the legitimacy of the UNSC’s engagement with the Court. That way, the enforcement of international criminal law by the ICC is likely to be limited to either rebel leaders who lack access to state apparatus or those who would have lost control of states apparatus. Conclusively, Prosecutor Bensouda’s courage and wisdom deserve to be commended. Her two decisions threw the ball in the states’ court, which are the ‘arms and limbs’ of the ICC. Her realist approach is likely to shift some of the unwarranted criticisms from the ICC and place them with the states and the UNSC. That said, it is clear that timing and patience are crucial in the enforcement of international criminal law. Perhaps the Prosecutor should not have gone for sitting heads of states in the first place. In the first decade of the ICC’s existence, the OTP appears to have had bitten off more than it could chew. This could be because there were too many idealists within its own rank and file. These two situations demonstrate that states have the ability to strike back against the ICC by controlling when or not to cooperate. It is now time for the fledgling international criminal justice system, centred on the ICC, to do some soul searching on how to ensure states cooperation in the global struggle against impunity. 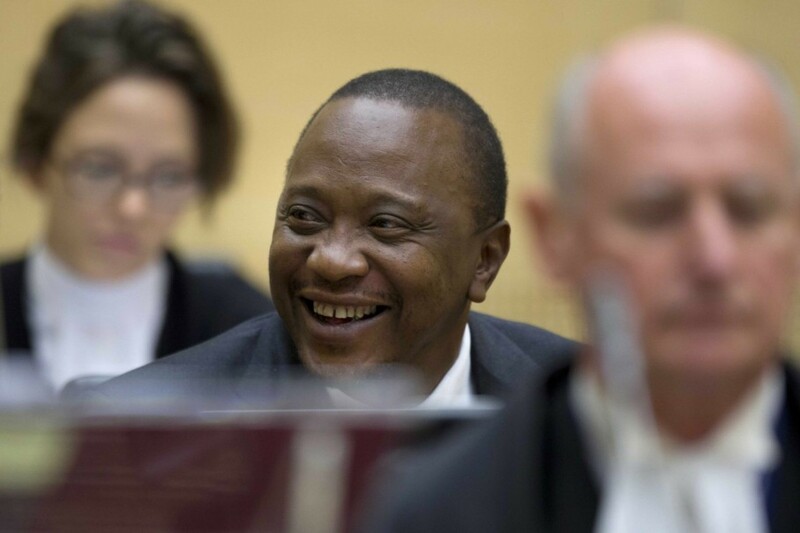 Kenyatta (ICC-01/09-02/11), Notice of withdrawal of the charges against Uhuru Muigai Kenyatta, 5 December 2014. Decision on Africa’s Relationship with the International Criminal Court, Ext/Assembly/AU/Dec.1(Oct.2013) Extraordinary Session of the Assembly of the African Union, 12 October 2013, Addis Ababa, Ethiopia.